Congratulations to Karina, Bernie and Pluta for a safe return home! 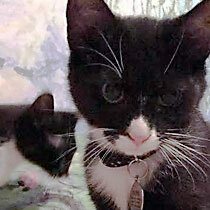 Pluta and his sister, six month old kittens, escaped from their home on April 6. The sister returned just a couple of hours later, but Pluta remained at large. He was seen several times around his home but always ran away. When DFD went to track the next day, Pluta’s scent was all over the yard and particularly strong near a few houses behind his home. A crawl space under a nearby home was identified as his favorite hiding place. His owners followed all of our recommendations, and Pluta was found just a few days later.